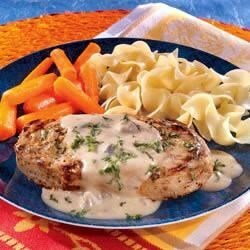 "Seasoned, browned pork chops simmer in a creamy mustard-laced mushroom sauce." Sprinkle chops with lemon pepper seasoning. Heat butter in skillet. Cook chops 10 minutes or until browned. Add soup, milk and mustard. Heat to a boil. Cover and cook over low heat 10 minutes or until chops are done. Sprinkle with parsley. I was grocery time and I was trying to be creative and found this recipe. I was absolutely GREAT! I enjoyed it with herb mashed potatoes and broccoli. It was a HIT!!!!!!!! My boyfriend and I love love love this dish!! It adds the perfect creamy tangy flavor to the chops. I'm making it again tonight!